Streaming, video and audio, is media content displayed in web browser software in real time. With streaming media, viewers do not have to wait to download an entire audio or video file before it starts playing. Media is sent in a continuous stream of data that loads concurrently as it plays through the web hosting server. Most web hosting accounts will have streaming already setup in your account. Check with your hosting company support to confirm this. In some cases you may need to install "mime" types and streaming in your control panel. HTML5 browsers like Google Chrome, Safari, IE9+, Firefox and Opera have streaming built into the browser software. Older browsers like IE7 and 8 can not play newer video files like mp4. In these cases a wmv file is usually used and the video may not stream on some computers. Flash software has streaming built into the player application plugin. How quickly does the video load? If your videos are taking a long time to load, and you are using a newer browser, then you probably do not have streaming installed in your hosting account. You will want to contact your hosting company and make sure that your account is setup to stream audio and video. One way to check your hosting account for streaming is to upload an mp4 file 10 or more megs in size. Use IE9+ or Safari, or download the Google Chrome browser and check the mp4 video file, live from your website link, in one of these browsers. If the video starts playing within 3 to 10 seconds then streaming is working properly on your website. Larger videos, 100 or more megs should start within 30 seconds (usually less than 15 seconds). Below are 7 popular video types and 2 audio types that allow for the highest compatibility in all popular web browsers. To have some of these movie file types work in your hosting account you may need to setup the "mime" types in your hosting control panel. See "troubleshooting on the HTML video support page. The most popular file type for HTML5 video. Works on most mobile devices as well. Excellent for streaming. Important: Be sure when converting to mp4 you use the H.264 (*mp4) option if available. Almost the same as mp4. Excellent for streaming. Required to display videos in Opera and some versions of Firefox. Excellent for streaming. Required for most versions of Firefox. Excellent for streaming. These are older less popular movie file types and are usually used for fallback. May or may not stream in some browsers depending on the computer setup and hosting account options. Fair to poor for streaming. Due to not being supported by Apple mobile devices this video type is now used for fallback in older Windows and Mac browsers. Excellent for streaming if Flash player is installed. The most popular audio file type. Streams in almost all browsers. Very few hosting accounts do not have this "mime" type already setup as a default with streaming. Newer audio type. With HTML5 code this file type is required for some browsers like Firefox and Opera that do not support mp3. You will probably need to have this "mime" installed in your control panel. For help with converting your video to a compliant media format, see "software" on the HTML video support page. Note: Be sure you have all the mime types installed for each of the above in your hosting account, otherwise these video and audio types will not play on your website. 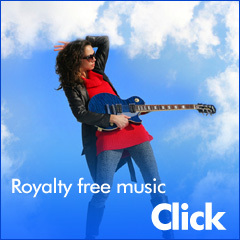 Video & Web Music Royalty free music for website & video, movie, Youtube projects. HTML5 / Flash Mp3 Skinnable mp3 website audio player. HTML5 Website Video Add-On HTML5 CSS video player website addon. Includes fallback for older web browsers. 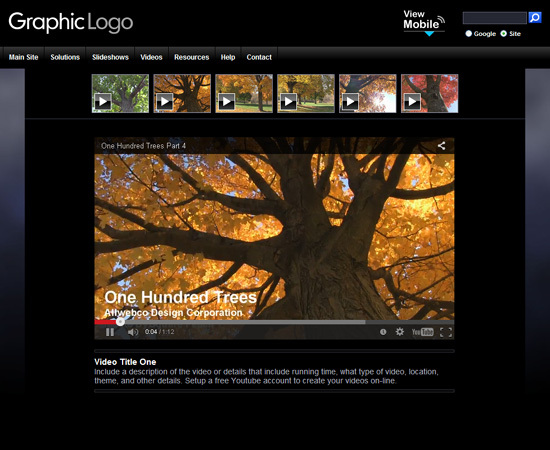 Video Minisites Themes Web templates layouts for small business with HTML5 video.